This topic provides an overview and examples for implementing speech recognition in a Windows Forms application. See the other topics in this section for more information and examples. Create a speech recognition grammar. Load the grammar into the speech recognizer. Register for speech recognition event notification. Create a handler for the speech recognition event. The following provides information about how to program each of these operations. Set the input for speech recognition. See Audio Input for Recognition. // Create a new SpeechRecognizer instance. To start an in-process speech recognizer that is under control of the application, create a new SpeechRecognitionEngine instance. See Initialize and Manage a Speech Recognition Engine for more information. One way to create a speech recognition grammar is to use the constructors and methods on the GrammarBuilder and Choices classes. The following example creates a simple grammar that recognizes the words "red", "green", or "blue". The words are added using a Choices object. For a match between user speech and the grammar to occur, the user must speak exactly one of the elements added by the Choices instance. The example adds the words as a string array that is the argument to the Add() method. After the Choices instance is created and set with the option strings, the example creates a GrammarBuilder instance. Using the Append(Choices) method, the example appends the colors object to the GrammarBuilder instance. In the last line, the example creates a Grammar instance and initializes it with the GrammarBuilder instance. // Create the Grammar instance. For more information about creating grammars, see Create Grammars. After the grammar is created, it must be loaded into the speech recognizer. The following example loads the grammar by calling the LoadGrammar(Grammar) method, passing the grammar created in the previous operation. See Initialize and Manage a Speech Recognition Engine for more information. The speech recognizer raises a number of events during its operation, including the SpeechRecognized event. For more information, see Use Speech Recognition Events. The speech recognizer raises the SpeechRecognized event when it matches a user utterance with a grammar. An application registers for notification of this event by appending an EventHandler instance as shown in the following example. The argument to the EventHandler constructor, sr_SpeechRecognized, is the name of the developer-written event handler. When you register a handler for a particular event, the Intellisense feature in Microsoft Visual Studio creates a skeleton event handler if you press the TAB key. This process ensures that parameters of the correct type are used. The handler for the SpeechRecognized event shown in the following example displays the text of the recognized word or phrase using the Result property on the SpeechRecognizedEventArgs parameter, e.
The following examples are components of a Windows System.Windows.Forms application that features speech recognition. Although the application displays a form when it starts, nothing of interest happens with the form. The first example contains the code for the handler for the form’s Load event, which is raised when the form is loaded. To use the System.Speech types in this example, you must first add a reference in your project to System.Speech. Also, make sure that you have completed all the steps described in Setup the Development Environment for System.Speech. Almost everything of interest in this application occurs in the Form1_Load method. The method builds a grammar incrementally using a Choices instance to add the strings "red", "green", and "blue". It then creates a GrammarBuilder instance using the Choices object. The method then initializes a Grammar instance with the GrammarBuilder object created earlier. The grammar, which is capable of recognizing the words "red", "green", or "blue", is then loaded into the speech recognizer. Finally, the Form1_Load method registers an event handler for the SpeechRecognized event. When the form loads, it automatically starts Windows Speech Recognition and its graphical user interface. You can activate speech recognition by saying "start listening" or by pressing the Microphone button. 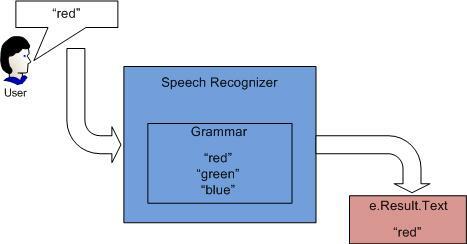 The sr_SpeechRecognized method, which executes when the speech recognizer raises the SpeechRecognized event, displays the name of any of the three colors that are recognized in the speech input. The following illustration shows the interaction between the user’s speech and the speech recognizer with its grammar. When the utterance matches an element in the grammar, the speech recognizer makes a recognition, and produces a recognition result. // Create a new SpeechRecognitionEngine instance. // Create a simple grammar that recognizes "red", "green", or "blue". // Create a GrammarBuilder object and append the Choices object. // Create the Grammar instance and load it into the speech recognition engine. // Register a handler for the SpeechRecognized event. // Create a simple handler for the SpeechRecognized event. The following example is autogenerated code for a Windows Forms application.